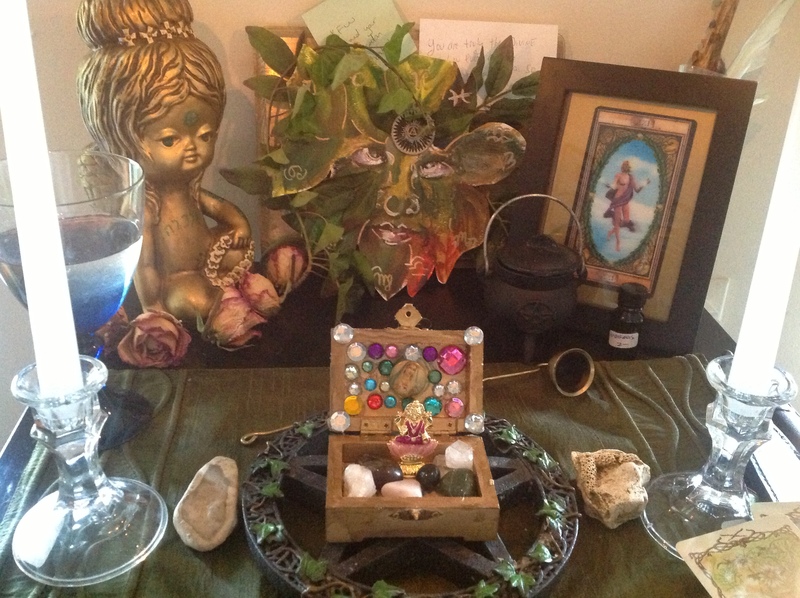 All I can say about the benefit of taking Biddy Tarot’s Master the Tarot Card meanings class is “WOW.” This entry is dedicated to reviewing the Biddy Tarot Class and discussing how it personally changed my life. For convince sake, you can call me D’arcy. I’ve been reading Tarot off and on for the past 10 years and professionally for the past 3 years. I studied the Tarot in depth when I colored an entire blank Color Your Own Tarot deck that I found while backpacking in Ecaudor. I completely fell in love with all the Tarot as I absorbed all the symbolism from studying the images I colored. I have also studied the Tarot in classes and workshops so my foundation in Tarot is pretty solid. One of the reasons why I found this class so valuable is because my goal is to design a Tarot deck to accompany my novel, which is constructed like a Tarot reading. Writing this novel has been a journey and I hope to have it ready to send off to publishers sometime this fall. The Tarot is a very intricate part of my writing and Brigit’s analysis of patterns, symbols, stories and Archetypes opened my eyes to how to deepen the hidden secrets in my novel with Tarot. On the novel, I’m really excited. I feel my story changing because of all the Archetype and story telling study that I’ve done. Brigit actually recommended an editor who reads Tarot to help me prepare my manuscript for when it’s ready to cross the threshold form my creation to fight it’s way on the desk of a publisher. The editor and I started talking on Sunday and she said she’s really excited to work with me after taking a look at my elevator pitch and a 10 page sample of my story. Once I get back from Indonesia, the editor and I are going to talk more about pricing but I think this is a great opportunity for me to see if my book is going to hit with my target audience and give me some ideas on what angle to work when selling my story. It’s not going to be cheap to get a professional publisher to review my work but it will be worth it. The best thing about this class was the webinars. I loved spreading out with my books, notebook and cards and diving into an hour and a half of international community discussion about the Tarot . The webinar page was user friendly with a simple, clean design. It was great that the program allowed us to watch Brigit and interact with her and each other via text. The only problem I sometimes had was that the conversation would move really fast in the text box while I was taking notes so I sometimes missed a lot of things other students had to say. The material for the class is also absolutely wonderful. First off, The Ultimate Guide to Tarot Card Meanings is a great resource for anyone interested in learning more about symbolism and different areas of life a card can express. The Ultimate Guide to the Tarot Meanings Companion Workbook is template based and allows you to journal about your discovers about the Tarot in a neat and organized fashion. 31 Days to read the Tarot with Confidence is fun book with all kinds of through provoking exercises to help tarot readers find new ways to think about the Tarot. We also received worksheets, valuable handouts and bonus guided meditations . A note about guided meditations: I’m debating about buying Soul Meditations to do while in transit between the Untied States and Bali, Indonesia. I think it would be very interesting to use on the 2 day journey to get to Bali. I’ll let you know what I decide and of course I’ll be reviewing my experiences about the Meditations on this blog. As an aside, I think another great companion to these Tarot books is A Writer’s Journey. It’s a must read for any storyteller because it analyzes the structure of mythology. I read it independently during class and enjoyed how it ironically complimented what we were studying. It makes quite a bit of reference to Tarot, Archetypes and the art of Tarot, all very important things to understand if you’re serious about becoming a confident, accurate Tarot reader. Not to be a teacher’s pet, but I really thought Brigit was an amazing teacher. She was always patient, sincere, kind and knowledgeable. If we ever needed help or had a question, we could always e-mail her personally. There’ s a reason why Brigit has built a six figure business out of Tarot reading and she’s an inspiration to anyone who wants to follow a dream. Many people in our class became inspired to go after their dreams as we studied. As a processional dreamer who has never failed to manifest my dreams, I love to see people be inspired. I hope that everyone who began to question their lives during our class have steered themselves onto the path that leads to the future they want. This class started off with a bang for me. I won the scholarship to the class. When I watched my video application, I felt that I was going to win and I did. On the first day of class, I got the Magician card to describe what I will get out of the class. As the class continued, I started to see my own personal power that took me on a beautiful, crazy, ten year long ride around the globe. I had forgotten how powerful I am– how powerful anyone can become with the right amount of will power can become. Class helped me remember that important message as I can become the Magician and began to create my own destiny again. The High Priestess became one of my teachers as I began to accept my intuition. It’s interesting because I drew The World often over the past three years and I kept asking “When? When will this cycle end”. The world is a beautiful card, but endings are often difficult, even if they need to happen. But now I see that new cycle is beginning and all the destruction from the old cycle created a future that I looks like the Four of Wands. Sometimes the Divine sends us messages we don’t understand until we live the stories out and make them more than something that’s happening– we make them part of our lives. This crazy writer’s journey may just be the path that is meant for me and now I’m going to follow it. I have taken a big leap of faith to travel half way across the world to Bali but I was inspired to go by this class and I feel that my life is about to change in a very, very positive way Honestly, going to Bali is one of the most beautiful, exciting, frightening things that I have done in a long time but the cards all tell me that the outcome will bring the 9 of Pentacles, the 10 of Cups, the 10 of pentacles, and the Sun– abundance, abundance, abundance! This entry was posted in mysticism, self help, spirituality, Tarot, Uncategorized, Writing and tagged biddy tarot, Malkuth, mysticism, self help, spirituality, tarot, writing. Bookmark the permalink. I agree D’Arcy. The course was fabulous on so many levels. I haven’t even had an opportunity to explore the many facets of this gem (several of the meditations, the last class, etc.) due to unforseen family matters (timing). The Webinars, the ebooks, the Q&As, the Quizzes, and the conversations of Facebook kept the flow and interest going with never a dull moment. You mentioned taking notes and missing some of the conversations. I also made that mistake during the first Webinar, and realized quickly to put down my writing instruments and throw myself into the ninety minutes full tilt boogie. Then I would go back and re visit the Webinar and take notes with much more assuredness of what actually needed to be written down, and what did not. Loving wishes to you, darlin, for your novel and for all things for which you wish and dream. Thank you for all your well wishes and good work in class! Love and Light to you! What a wonderful blog! I agree with all your comments about the webinar and Brigit’s teachings. I hope success in your writing career. :). Thanks Marianne! It’s been wonderful connecting with everyone. More insights and adventures to come so please check back frequently! This class sounds awesome! I’ll have to look into taking it the next time it is offered. Also I would really recommend the Soul Meditations. I’m doing them right now and they are so profound and inspirational. I’m only doing one a week, but I can imagine doing all of them in 2 days would be a crazy insightful double journey for you. I ended up not buying them because I got caught up in a whirlwind and now I’m in the airport getting ready to depart. But they are on my must but list!